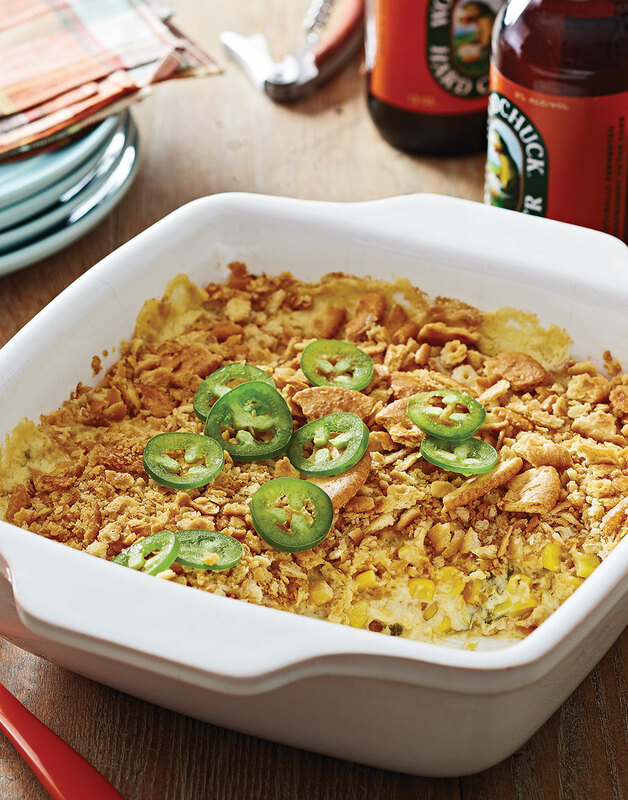 Creamy, crunchy, and spicy, this Jalapeño Scalloped Corn is everything you've been dreaming of. Purée cream-style corn and neufchatel (to keep the dish rich, but not too heavy). Then top off the casserole with Ritz crackers for an extra bit of buttery crunch. Preheat oven to 375°. Coat an 8-inch square baking dish with nonstick spray. Melt 4 Tbsp. butter in a saucepan over medium-low heat. Stir in scallion whites and sweat until nearly softened, 5 minutes. Stir in jalapeño and garlic and sweat until softened, 3 minutes; remove from heat. Purée cream-style corn, neufchatel, and mustard in a food processor; transfer to a bowl. Stir in scallion white mixture, scallion greens, whole kernel corn, and ½ cup crushed crackers; season with salt and pepper. Transfer corn mixture to prepared baking dish. Toss together coarsely crushed crackers and melted butter. Bake scalloped corn 25 minutes; sprinkle scalloped corn with buttered cracker mixture and bake until topping is golden, 10 minutes more. Let scalloped corn sit 15 minutes before serving.